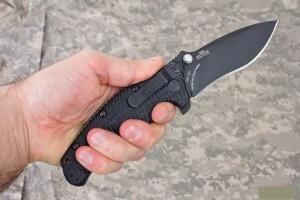 The Zero Tolerance 0200 is a tactical folding knife with a dangerously sharp plain edge. Upon closer inspection, the knife looks less threatening and does not seem to be very sharp at all but after a single use you will find that the sharp tip is just the beginning. 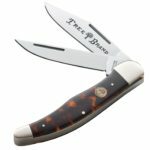 The modified recurve blade is very sharp which makes it a great knife for outdoor use. It can cut and slice anything and will keep its quality sharp edge no matter what. 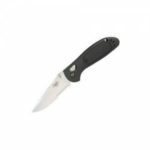 The blade also has a wonderful black finish that reduces the effects of corrosion and rust. 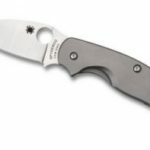 The handle is very durable too and will efficiently hide the blade looking like a small ingenious tool. The handle well-textured and has a defined shape which allows you to handle it with ease despite wet hands. The handle is specially textured so you can grip the knife effectively plus the locking mechanism will never let you down. The knife is kept using a liner lock and maybe opened with one hand by pressing on a thumb stud. 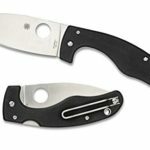 The pocket clip, on the other hand, will allow you to keep the knife firmly in your pocket. 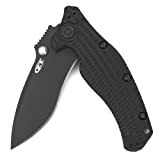 This knife is also light for its size and will definitely be a breeze to carry with you anywhere you want to go. You may place it in your pocket or in your purse and take it out when you need to. It is made in the US which means it has the best quality standards. Be sure to check from where you are located if carrying a tactical folding gun is legal before you purchase. Some states require a permit to carry for specific types of knives so be very careful. 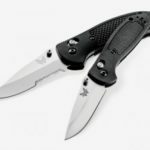 The price of the Zero Tolerance 0200 is definitely more expensive compared to other knife models with the same features and style. It is priced at $160 online. But of course, this price is just a small price to pay for quality. Zero Tolerance knives are known to have the best quality and features despite the cost. 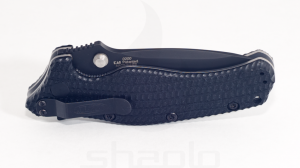 The Zero Tolerance 0200 folding knife is recommended for new knife owners and for collectors that would like a one-of-a–kind knife model with the best features. It is highly dependable, very efficient to use even when wet or under pressure and will fold down into a small tool when not in use. 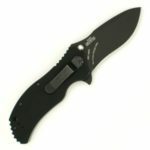 It is light to carry but packed with power and features that you may be looking for in a pocket or folding knife.